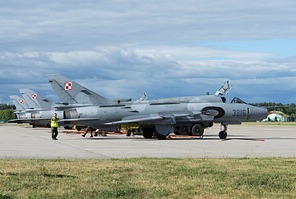 Helmut Richter visited the Swidwin open day held by the 21.BLT, home of the Polish Air Force's remaining Su-22 'Fitters'. Like most other air bases in Poland, the Polish Air Force base at Swidwin hosts an annual Piknik Lotniczy or air picnic, a small open day designed for the local public, typically with a very limited flying display and a small number of static exhibits only. Swidwin always holds its Piknik Lotniczy around the 1st of July, which is the founding date of 21. Baza Lotnictwa Taktycznego (21.BLT) in its current form, which was constituted from 7.elt, 8.elt and 40.elt (elt- eskadra lotnictwa taktycznego) on 1 July 2010. 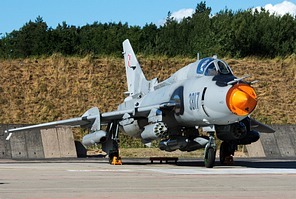 With this reorganisation, all Su-22 operations of the Polish Air Force were concentrated at a single base. Afterwards, 7.elt was disbanded as a Su-22 squadron and re-established at Powidz as a special operations squadron (7.eds) flying Mi-17-1Vs. Also based at Swidwin is a detachment of 1. grupa poszukiwawczo-ratownicza (1.gpr) to provide SAR services operating W-3RLs. In difference to the Piknik of 2017, which was drowned in rain, the weather forecast for the 2018 Piknik was excellent and I decided to already go for the Friday before the Piknik in order to catch any arrivals or rehearsals. Positioning in the south of the approach to Runway 29 was convenient and while there were only very few arrivals for the static display, the Su-22M4s performed two rehearsals of their 2-ship tactical demo, each time with different aircraft, and another Su-22UM3K came back home. On the show day itself, I decided to move on the north side of the runway for the Su-22 flight line and the static, although it was also possible to stay in the parking area, which had been established in the south of the eastern part of the runway and offered decent photo opportunities for the flying display. 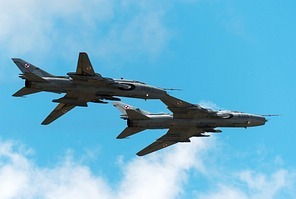 The military part of the flying display just consisted of the Su-22 2-ship demo and a joint display by the Polish Air Force MiG-29 and an XA41 aerobatics plane flown by Artur Kielak. Both displays were performed twice, in the morning and in the afternoon. There were some other displays by civil and vintage aircraft and a Police Mi-2 performing a fire fighting demo. The static was quite small but conditions for photography were excellent, in particular in the late afternoon after the crowd had already left the base. 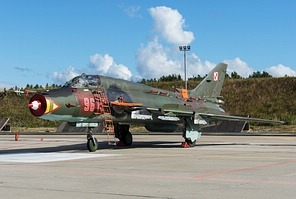 The aircraft were displayed without barriers with the exception of Su-22M4 3817, which was arranged with its external weaponry, but even this aircraft was cleared from the barriers when the stores were taken away in the afternoon and became available for clean images in optimum light conditions. The only foreign aircraft present was a German Tornado IDS from TaktLwG 51. For a small event at a rather remote air base, the Air Picnic at Swidwin still attracted a good number of spotters, even having traveled long distances, which certainly is a tribute to the last Su-22s operating in Europe. When I left Swidwin at the end of the picnic, I certainly was not disappointed.